Rather than detail our itinerary -- I'd prefer to give some highlights. If you'd prefer - you can also just check out the 150+ pictures we took. Generally - daily living in Australia isn't radically different than daily living in the US. We found the country, as a whole, extremely socially diverse, quite cultured, modern, oh... and not cheap (The USD was worth about 7% more than AUS dollar while we were there). In comparison to NYC, though, it was much cleaner of a city and a lot less crowded...People seemed genuinely nice - as advertised. It was Amy and my first "tour package" - and definitely not our last. The fact that almost every mundane detail (such as airport transfers, breakfast, tours of city/highlights, etc) is completely taken care of for you. (And best of all - you've already paid for it - so you don't think twice about spending the money). Amy and I were joined by 24 other people on our trip -- all of who were very nice. Sydney was our favorite stop of the 3. The past 8-10 years living in NYC, we suppose has worn off on us. At this point in our life - I think we just enjoy the bigger city offerings of trendy lounges, good food, and faster pace. Plus, while in "tourist mode", Sydney offered us a lot more to do and see. I had one of the best meals of my life on Christmas eve. We ate our first Australian lobster (pictured on the right) - which I learned is different (and better) than the Maine lobster we obsess about here in the US. Instead of the tail and claws containing the premium meat -- the Australian lobster houses the creme' de la creme in it's body... This enables the chef to more easily prepare a dish (and equates to much less work on our part). Australia is in the midst of a 10 year drought - which causes a big "fly community." I joked around that I would be mistaken for raving without glow-sticks, but I was really just swatting away flies.. The two most prominent American Chains in Australia in our view were: Starbucks and 7-Eleven. McDonald's is there - but seems to be more focused it's McCafe off-shoot rather than it's bread-and-butter. There is also no Burger King -- Only Hungry Jacks. That's about it for now ... 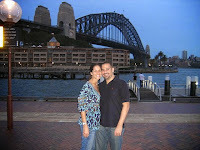 Overall - Amy and I had a GREAT trip and really enjoying traveling and exploring Australia for the first time. When the jet lag wears off - I'll re-read this and add anything else that I left off. Goffin, you're the man! I got gmail (which of course was secretly named so because of your last name) cause of you and now I'm gonna blog cause of you. You're my hero! Speaking of which, I'm gonna go watch a few episodes of Heroes. I hope all is well with you g-funk. We have nicely shaped heads. Holla at me!